23,000 Dolphins are about to be Brutally Slaughtered. Did you know? This evening I watched the most disturbing, sickening documentary. It's called 'The Cove' and it is an exposé on Taiji in Japan and their most revolting trade, slaughtering dolphins. A dolphin activist, Ric O'Barry is determined to learn what goes on after the dolphins are forced into a cove and 'the best' are chosen by dolphin trainers and sea parks for their businesses. For the dolphins that are not chosen, they meet a horrendous end as they are forced into a secluded cove and murdered by fisherman. But people are refused entry, no one is allowed to witness this unjust slaughter, what are they so desperately trying to conceal? The footage that was captured is horrific, cruel and heart wrenching. I would even go as far to say it is traumatising. 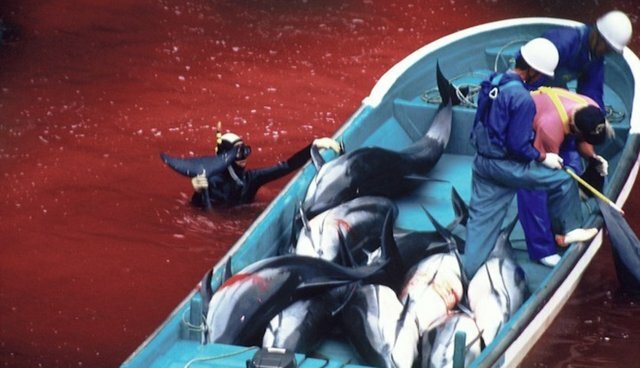 The sea turns blood red as the dolphins thrash and try to flee their imminent death. The sounds of the petrified dolphins as they witness their family members die before perishing themselves is horrendous. The helplessness of these intelligent, emotional animals and the trauma and distress they suffer at the hands of humans is revolting. The most upsetting fact is this documentary was released in 2009, it is now 2014. People have seen this footage, they have seen this unnecessary slaughter yet it is about to resume now in just one week. On September first, the first few dolphins will be murdered and this will continue UNLESS we can raise awareness. I can't believe I haven't seen this until now, but it has inspired me to take what little action I can. The dolphins that are murdered are said to be used for their meat but that meat is poisoned by mercury, meaning it is toxic and harmful to humans. The Japanese say the dolphins are slaughtered due to pest control, they say they eat to much fish. Well for a start, the dolphins have every right to fish, the ocean is their habitat and fish their natural diet, why do they not have a right to this? Studies have also proved that this is not the case, dolphins are not contributing to the depletion of fish, yet again, this is the fault of humans. So, why? Why are these dolphins being murdered? What purpose does it serve? They are intelligent, gentle creatures who have been known to help humans not hinder them. Why are humans thanking them by keeping them in captivity and slaughtering them in this hellish cove in Japan? How many more places are there in this world that people don't know about? How much longer will the dolphins suffer this nightmarish cove as their lives are ripped from them? How will you take action? Firstly I highly recommend watching 'The Cove' and let friends and family know about it. I believe in generating awareness. Secondly, there is a few online petitions to sign, perhaps with enough signatures, change can be brought about. It's better than doing nothing, right?